Unite has rejected David Cameron's suggestion it encouraged members to strike after it "scented weakness" in the PM's handling of its row with BA. Spokesman Brian Boyd said Mr Cameron had shown naivety in his knowledge of "real industrial relations". Gordon Brown rejected the Tory leader's charge saying he was doing everything he could to get staff back to work. They spoke on the second day of the latest cabin crew strike on which BA said 59% of flights left Heathrow. Some 63% of flights due to arrive at the airport did so while Gatwick and London City airports operated as normal, BA said. A small number of flights from Manchester, Newcastle, Aberdeen, Edinburgh and Glasgow were also cancelled. Speaking on BBC One's Politics Show earlier, Mr Cameron said Mr Brown had failed to back those cabin crew staff who chose not to strike. "I think the unions have scented weakness in the government and that's one of the reasons why we're seeing quite so many strikes," he added. Unite's Brian Boyd: "The parties who will settle this dispute will be BA and Unite"
Asked if that was the case, Mr Boyd, Unite's national aviation officer, replied "not at all". "It's an industrial dispute and Unite and British Airways will resolve that," he told BBC News. "They will resolve that by each party sensibly seeing what they can achieve for both themselves and the business and, hopefully, we can get down to the business of doing that over the next couple of weeks." Mr Brown, meanwhile, told the Politics Show he wanted the cabin crew back at work and that the government had "said we don't want this strike". "But we also want to make it possible for arbitration and negotiation to take place," he added. Cabin crew are protesting about BA's cost-cutting plans which include reducing the number of staff on long-haul flights. In an internal message sent to staff on Sunday, BA chief executive Willie Walsh said that, on the first day of the strike on Saturday, 63% of staff due to work had turned up. This was compared with 57% on the first day of last weekend's strike, he said. 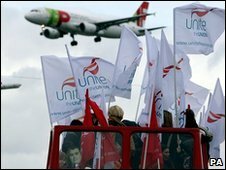 Unite, meanwhile, said that 359 cabin crew had reported for duty on Sunday and estimated that 2,100 were employed on a normal working day. An official added: "Most long-haul flights are running with two fewer crew." A spokesman for BA said: "Our operations continue to go well today and we remain on track to deliver our objective of flying more than 75% per cent of our customers to their destinations during this strike period." The current strike is due to end on Tuesday. The union has said more industrial action is possible but that it will not be taken before 14 April. BBC political correspondent Carole Walker said the strikes were the "last thing that Labour needs" ahead of a general election. 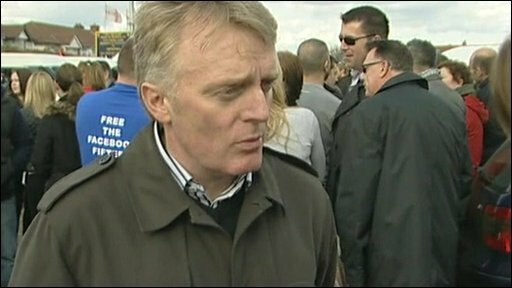 The dispute had been a headache for Mr Brown, particularly because of Unite's close links with the Labour Party, she said. But if a planned rail strike were to go ahead on 6 April, that could be a much bigger problem. Particularly as that was the date he may have been planning to go to Buckingham Palace to start the election campaign, our correspondent added. What perks have BA staff lost? Q&A: What's the dispute about?